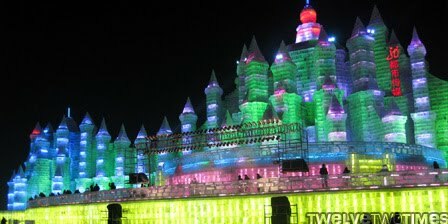 We made it to the 12th Annual Harbin Ice and Snow World last night for free, thanks to a sweet deal provided by the university. We prepared for the night out in the cold by getting every piece of winter clothing out, wearing it, or packing it in a backpack just in case. Before heading off to see ice castles, we "crashed" a banquet hosted to honor the contestants and volunteers participating in the university's snow sculpting contest. The food was great. During the meal, we met Anna from Russia. Anna was no ordinary contestant. She visited our house 2 years ago with her team! We remembered sitting around eating tacos with her and her team. And now two years later, we meet again at a random banquet. Amazing! The meal concluded and we boarded the bus to continue to the Snow World, but we were delayed 45 minutes waiting for the second bus to get out of the restaurant's parking lot. It was locked in a massive traffic jam. Then smooth driving over the new bridge, by the tiger park, and on to the Ice and Snow World. 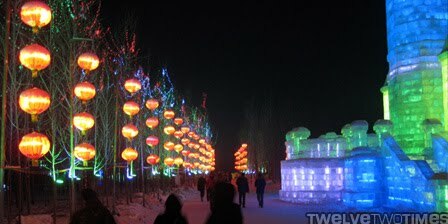 We wandered around the ice and snow world for 1.5 hours never once going inside to warm up. Even though we had the option of going inside to buy a new coat, sign up for a cell phone (at two different vendors), eat Japanese food, drink Nescafe, eat KFC, watch performances (one looked rather seedy), or go inside to the men's smoking room (aka the restroom). One minor wipe out on the ice slide (M'Lynn took my legs out from under me as she came down the slide second) and one stick of sugar coated frozen solid strawberries, time was up and we head back home. 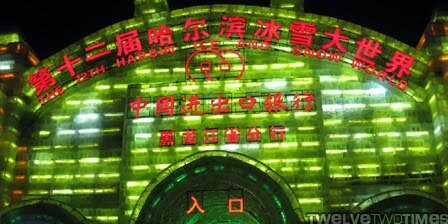 If you're ever in Harbin, we welcome you to pay the 330 RMB entrance fee to see it for yourself.